Elliott Hundley. The Lightning’s Bride, detail, 2011. Wood, sound board, inkjet print on Kitakata , pins, paper, plastic, magnifying lenses, metal, photographs, wire, found paintings; 99 x 289¼ x 19 inches. Courtesy the artist, Andrea Rosen Gallery, and Regen Projects. © Elliott Hundley. CREDITS: Producer: Ian Forster. Consulting Producer: Wesley Miller & Nick Ravich. Interviewer: Wesley Miller & Susan Sollins. Camera: Marc Levy, Miguel Drake-McLaughlin & Justin Thomas Ostensen. Sound: Michael Carmona & Neal Doxsee. Editor: Morgan Riles. 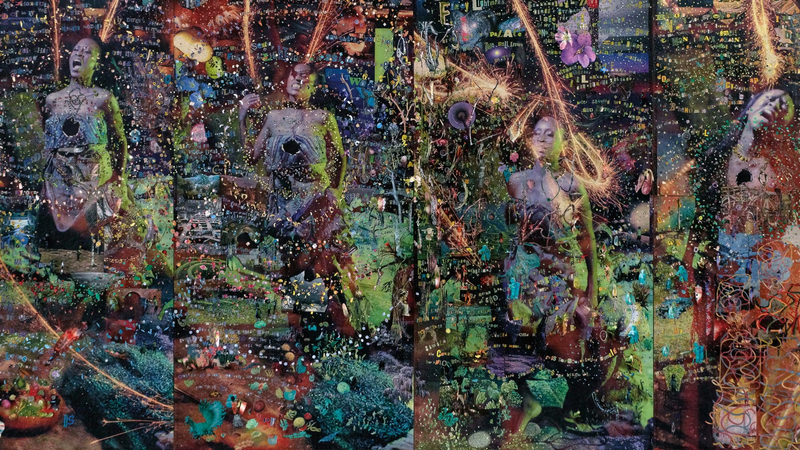 Artwork Courtesy: Elliott Hundley, Andrea Rosen Gallery & Regen Projects. Theme Music: Peter Foley.